UPDATE (07.29.18): during this year’s Midsummer Scream panel, Universal revealed a few small-but-highly-intriguing details regarding what is sure to be its headliner haunted house. For starters, the company admitted that it had initially played around with a version of the maze that spanned both of the show’s two released seasons, but the design teams on both coasts found that to be a subpar haunt experience; they didn’t want to shortchange either the narrative or the atmosphere, and they wanted to retain the ability to effectively build tension – such as when guests are forced to hoof it through the woods while hearing the chittering of the Demogorgon hunting them. Speaking of the extra-dimensional predator, attendees should expect to see a few different versions of the creature, including costumed scareactors in both closed- and open-mouthed variations (in a really cool touch, Universal announced that it’s 3D-printing the Demogorgon’s teeth, since those’ll be the first items to come lose and get lost over the course of a night. In this way, an authentic recreation of the monster can be experienced each and every night). A puppet will also be utilized, allowing the Gorgon’s mouth to actually open and close while on the move. Similarly, several different techniques will be employed to realize the Upside Down, including projections, a backdrop that was provided directly by Netflix, and fiberoptic lights of various lengths, which are wrapped in a snow blanket (to help diffuse their light and thereby make them look like the alternate reality’s telltale floating spores) and then blown by fans. Finally, in what is arguably the coolest tidbit, Universal announced that its version of the Hawkins Lab set will be the same exact size as the one filmed on Stranger Things‘s soundstage. This not only means guests will be setting foot on a two-story set, but that they’ll also be able to walk around Eleven as she’s submerged in her tank while undergoing the Department of Energy’s various experiments. Ever since Netflix jumped headlong into the original-content pool with 2013’s House of Cards, the streamer has managed to produce several high-profile and memorable series. 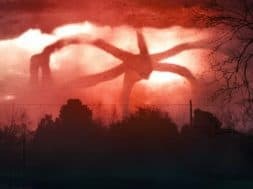 None, however, has managed to top Stranger Things in terms of either cultural impact or creative synthesis – not to mention paranormal creep factor. Part X-Files, part John Carpenter, part Goonies, and all ‘80s nostalgia, the series became an instant social phenomenon when its first season dropped in July 2016, making stars of its young (and older, in the case of David Harbour) cast and household names out of its creators-showrunners, the Duffer brothers. Its quirky sensibilities, engaging narrative, and other-worldly suspense all combined to make a perfect storm in the horror world, unleashing a television show that transcends the genre and explodes across the entire cultural spectrum – and it is precisely these elements that all combine to make it a perfect candidate for a Halloween Horror Nights haunted house, as well. Luckily for us all, Universal agrees, as it has today announced that Netflix’s golden goose will be making an appearance at this year’s event. 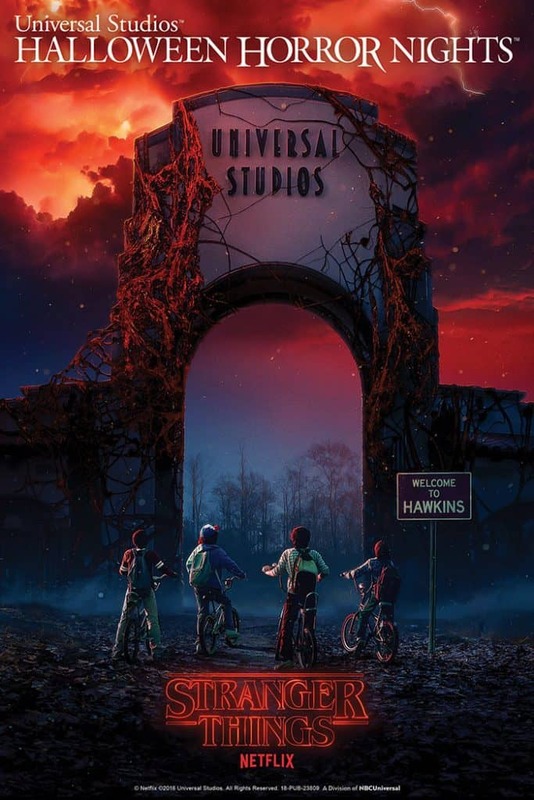 Based just on the first season, the HHN maze will take guests to early-‘80s Hawkins, Indiana, where the US Department of Energy has been experimenting with psychokinesis and trans-dimensional travel in equal measure, inadvertently unleashing a series of alternate-reality carnivores on the sleepy town along the way. Expect to hit up both sides of the dimensional divide in the haunt, starting with the fictitious town – including its school as well as the main characters’ various houses – and ending up in the Upside Down, the dimension where biology has gone all topsy-turvy and which is home to a malevolent presence that is looking to extend its control into our world. The sheer amount of retro fun that Universal’s Art and Design team can have in fashioning a Stranger Things experience just might end up being worth the price of admission to the event all by itself. When combined with the series’s potential impact on Horror Nights attendance – how many properties at HHN have their own, year-round dedicated section at Targets across the country? – we could potentially be looking at the very next Walking Dead or American Horror Story, a haunt that comes back year after year (especially considering that Stranger‘s third season is soon to commence production for a release sometime in 2019, paving the way for at least two more potential Horror Nights appearances over the next two years). Stranger Things will arrive at Universal Orlando’s Halloween Horror Nights, which runs for a record-breaking 34 select nights, from Friday, September 14 to Saturday, November 3.